[“COVERS FLEW OVER THE LAND OF MORNING CALM”] On November 15, 1991, Asiana Airlines, South Korea’s second international carrier, inaugurated flight between Seoul and Los Angeles. 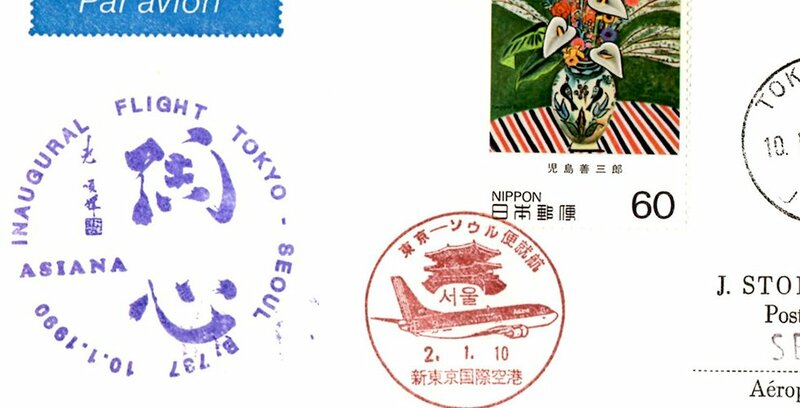 No first flight covers (FFCs) are known to exist for the return flight as philatelic recognition from United States Postal Service was not requested by Asiana Airlines according to United States Postal Service. 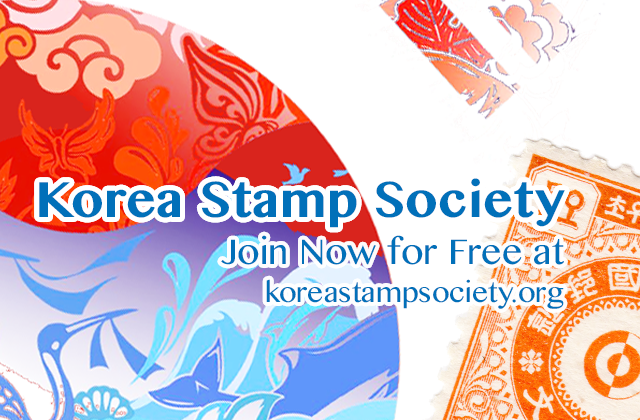 For the initial flight from Korea, someone would be very hard-pressed to find any “philatelically-carried” first flight cover either and I’ll explain why I think the chance of having such FFCs for the transpacific inaugural flight by Asiana Airlines is very slim. It stems from my personal experience in Seoul a year before the transpacific inaugural flight. Asiana Airlines became Korea’s second international carrier after Korean Air or KAL, inaugurating flight between Seoul and Tokyo, Japan, in January of 1990, when I happened to be in Seoul on vacation. The international first flight was advertised with huge banners outside Asiana Airlines headquarter building in downtown. Some vertical banners were several stories high. Advertisements were seen on many overpasses all over the city as well as most of leading newspapers leading up to the flight date. I couldn’t possibly be unaware of this pending flight even if I wasn’t a collector of flight covers. 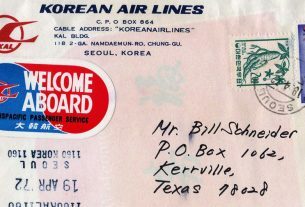 Happily, I prepared covers, properly addressed, as I would have in the US, and sent them to both Asiana Airlines and Korean Philatelic Center, where rubberstamped cachets for first flights usually provided to the collectors and processed the covers for such flights. Hi Stanley, in figure 1 the address is a poste restante address at “Seoul Airport”. At the time (pre 2001 opening of Incheon) this must have been Gimpo International Airport (김포국제공항; also Kimpo). 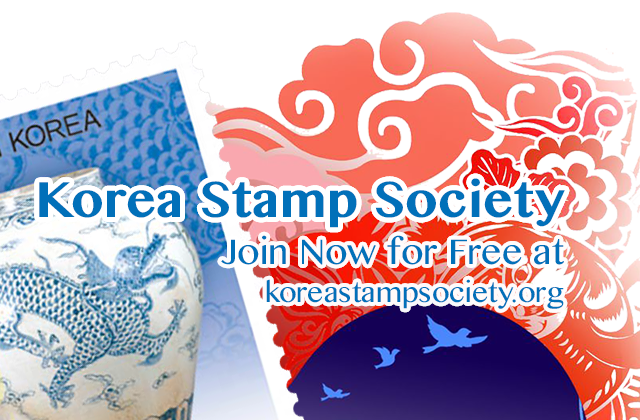 Did Gimpo have its own post office? Or if not, where would this poste restante address have been? Yes, Kimpo International Airport had own post office. But First Flight Covers were handled differently, depending on how the covers were prepared. You could put the receiver or the sender’s address at front instead of “Poste Restante” at destination airport. In either way, the covers would be handled in the same manner when they arrived in Korea. Kimpo had the post office, but it wasn’t the post office that handled this FFC or any other “international” mails. 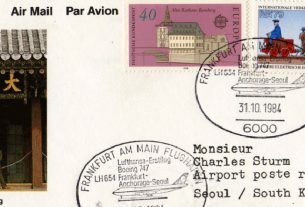 When the international mails arrive at the airports, including FFCs, these covers would have been delivered to IPO (International Post Office) as it was back-stamped on Fig.1 regardless of where the covers were addressed to. In 1990, IPO would have been in Mok-Dong, Yang Cheon-Gu, Seoul. The current IPO is in Inchon, by the way. Then these Poste Restante covers would have been held at IPO, obviously not having real addresses to which can be delivered. As you know, the regulation dictates the Poste Restante covers are supposed to be returned to the sender after a certain holding period. So IPO would return these covers, after the holding period, thru Kimpo Airport back to the sender. During 1988 Seoul Olympics and leading up to the Olympics, you would find covers back-stamped with “Hodori” Olympic Commemorative postmarks from, yes, “Kimpo Gong Hang – Kimpo Airport”. If I’m not mistaken, I’ve only seen the postmarks, commemorative or regular, from Kimpo Airport when the covers were dispatched back to the senders, not upon the receipts. That’s quite interesting actually. Talking about poste restante: so the current poste restante office would be Incheon IPO? Or could you (even today) use “poste restante” for any post office in Korea? Aerophilately is quite interesting as a matter of fact. First Flight Cover collecting in USA pretty much died after AAMS (American Air Mail Society) ceased issuing Advance Bulletin services for upcoming first flights. Getting back to your questions, for senders, they wouldn’t know to which post offices to be addressed, especially in foreign countries. They would only know the destination cities. So, “Poste Restante” would be addressed to either Seoul or Incheon, if the flights go to Korea. Yes, current Poste Restante for Korean airports would be Incheon IPO. Incidentally, IPO was moved to Incheon in October, 2007 and located in Cargo Terminal A. It was moved from Mok-Dong, Yangcheon-Gu, Seoul. As you intuited, you could actually write any post offices, i.e, any cities in Korea for Poste Restante. It will go there and be held until it returns back to IPO and to the sender. There is another aspect of Aerophilately called “dispatched” covers, which are the covers dispatched from the third party county, nothing to do with any cities of the origins or destinations for the first flights. My collecting interests exclude those dispatched covers or special flights, but I might write up something for that later, along with the hand-carried flight covers, which are non-philatelic. The term “dispatched covers” is something I should remember! This is something which also exists for paquebot covers: collectors sending covers to captains or other people on board ships without actually being on those ships themselves (but they would be the receivers of the covers). As a matter of fact, I guess 95+% of all paquebot covers after the 1940s are dispatched covers. Good term, wish I had known it before!